A pack of Columbus Grove defenders stop Carey’s Austin Hertel during Friday night’s Division VI, Region 22 playoff game at Columbus Grove’s Clymer Stadium. Columbus Grove’s Garret Nemire gets past Carey’s Adam Hackworth during Friday night’s Division VI, Region 22 playoff game at Columbus Grove’s Clymer Stadium. COLUMBUS GROVE — Halftime adjustments are usually necessary in football. However, for Columbus Grove, it was just a matter of sticking to the game plan. After going into the halftime break tied with Carey, veteran Columbus Grove coach Andy Schafer told his team to just relax and play its style of football. 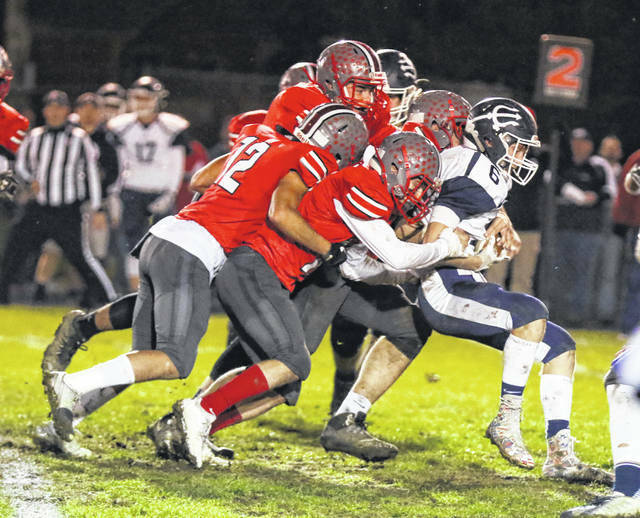 Columbus Grove came out in the second half of Friday’s first-round game of the Division VI Region 22 playoffs at Clymer Stadium and pulled away for a 21-7 victory over Carey. Columbus Grove (8-3) will play Seneca East, a 33-9 winner against Loudonville, in a regional semifinal at 7 p.m. Friday at a site to be determined. This is Columbus Grove’s first playoff appearance in four years. Last season, Columbus Grove had just two wins. “There were probably some people who thought we should have called some time outs and get one in before the half,” Schafer said. “I just said that we just needed to get into halftime. We actually have a pretty new coaching staff. We haven’t experienced this. Carey had been in the playoffs – two games deep last year. So, we just talked to the team and said, ‘Just calm down guys. Last time I looked, we were at Columbus Grove. It shouldn’t be like a playoff game, but it should be like a regular game. So, let’s just go out there and play’. Columbus Grove’s defense was stellar, holding Carey (7-4) to just 190 total yards on the night. “We talked about how the Northwest Conference has prepared us for a physical game,” Schafer said. “It really did. As soon as we started hitting, we thought, ‘This is like the Northwest Conference’. After a missed opportunity by Columbus Grove to start the game, Carey capitalized. The very first possession of the game, Columbus Grove drove 50 yards before Rece Verhoff attempted a 28-yard field goal. Verhoff’s kick was no good and the Blue Devils took over. broke loose on a sweep to the left side and ran it in from 46 yards for the score. Ian Yeater’s extra point gave the Blue Devils an early 7-0 lead. However, the Bulldogs would answer. Columbus Grove got on the scoreboard with a little more than nine minutes left to play in the first half. The Bulldogs traveled 72 yards in 10 plays and capped off the drive with a 31-yard touchdown pass from quarterback Blake Reynolds (10 of 22, 147 yards) to Gabe Clement. With the extra point by Verhoff, the score was knotted at 7 apiece, which held up until halftime. In the first half, Columbus Grove recorded 136 offensive yards (63 rushing, 73 passing), while Carey moved the football for a total of 114 yards (113 rushing, 1 passing). Columbus Grove finally claimed the lead at the 4:22 mark of the third quarter. The Bulldogs mounted a 13-play, 58-yard scoring drive, capped off with a 2-yard run by Reynolds. With the extra point, the Bulldogs led for the first time, 14-7. That seven-point advantage for the home team held up to the third stop. On the next possession, Carey gambled. The Blue Devils attempted a fake punt and Columbus Grove stuffed the play out in a hurry. 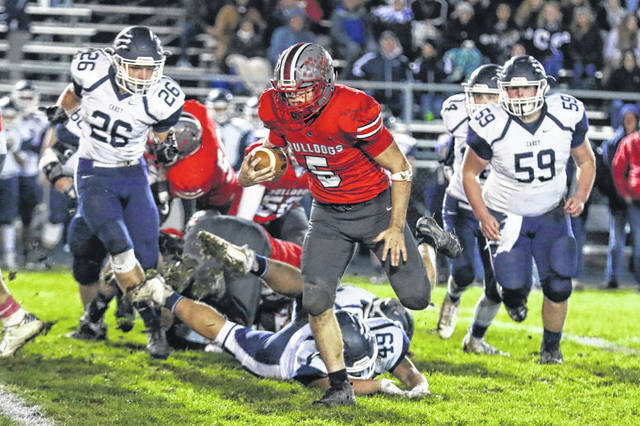 The Bulldogs now had excellent field position at Carey’s 38-yard line. Columbus Grove then traveled that short distance in four plays for a quick score. Reynolds found Caleb Barrientes (2 catches, 41 yards) open for a 26-yard TD pass, giving Columbus Grove the 14-point lead, just seconds into the fourth quarter. Early in the game, Columbus Grove senior running back Garrett Nemire went down with an injury, forcing Schafer to turn more to senior Brady Hauenstein (19 carries, 50 yards) in the backfield. This entry was tagged columbusgrove. Bookmark the permalink.